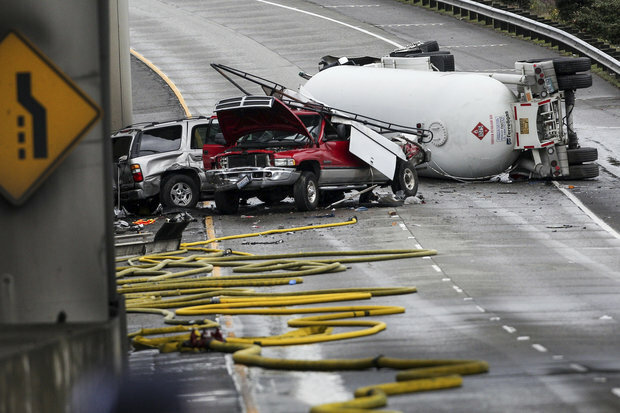 At approximately 10:30 a.m. on Monday, February 28th, a tanker truck carrying liquid petroleum gas rolled over on Interstate 5 in Seattle. The crash shut down all lanes of the interstate in both directions, and necessitated a multiple-hour cleanup involving firefighters. A homeless camp near the site of the accident was evacuated by emergency responders due to concerns that the petroleum could cause injuries or start a fire. Three people were injured in the crash and transported to the hospital. All three sustained injuries that were reported to be non-life-threatening. The backup from the crash was so long and severe that it caused traffic problems on Interstate 90 and the West Seattle Bridge. The I-90 express lanes were closed to most vehicles in order to help emergency vehicles get to the site. Traffic had already been disrupted in the morning hours by snow that blanketed parts of Seattle, and a shower of hail during the afternoon further complicated conditions for commuters. The backup was so bad that the Washington State Department of Transportation advised drivers to avoid all roads in the Seattle area if they could, and to contact the department for help finding a route if it was absolutely necessary for them to drive. They also told drivers stuck in the traffic jam to conserve gas by turning off their vehicles. Commuters planning on traveling through Snoqualmie Pass faced an additional challenge getting home, as westbound I-90 was closed due to a log truck that had rolled over. As the backup stretched towards afternoon with no signs of clearing, a taco truck that had been caught in the jam opened for business. Hungry drivers lined up that the Tacos El Tajin truck for lunch. Owner Thomas Lopez had been on his way to serve lunch in South Lake Union, but after the crash he ended up stuck behind the tanker truck. “We are ready to serve food, everywhere,” Lopez told reporters. Local news sources debated whether the epic traffic jam was truly the worst that Seattle has ever seen. They pointed out other long traffic disruptions such as the 2015 spilled fish truck incident, the Chinese president’s visit, the Skagit River Bridge collapse, and the Chinese president’s visit as other incidents that disrupted traffic for hours or days. The crash highlighted one of Seattle’s greatest infrastructure vulnerabilities: while more drivers take to the streets each year, traffic flowing through the city passes through bottlenecks as routes cross over water, rise on elevated routes, or disappear into tunnels. A single crash at the wrong spot can disrupt the flow of traffic for tens of thousands of people, causing backups that stretch for miles; those traffic jams can also make it difficult for emergency responders to reach the scene of an accident.